River Herring is a collective term used to describe both anadromous alewives and blueback herring. The alewife is the more common of the two species in Maine. River herring are anadromous (sea-run) fish that spend the majority of their life at sea but return to freshwater to spawn. Both species are native to Maine rivers. Alewives and blueback herring have co-evolved and co-existed with other native fish and wildlife in Maine’s streams, rivers, ponds and lakes for thousands of years. The historical distribution of this species is throughout the Atlantic seaboard, from Newfoundland to the St. Johns River, Florida. What is the life cycle of the alewife and blueback herring? Spawning populations of alewives are found in rivers and streams along the Maine coast. Spawning alewives average 279-305 mm and weigh about 230 g (Kircheis et al, 2004). The numbers of repeat spawners vary but may be as high as 25% of the total run. Adults enter rivers from early May to early June and swim upstream into lakes and ponds to spawn. The temperature range for spawning is 12.8-15.5 °C. Each female produces 60,000-100,000 eggs, depending upon the size of the individual fish. The majority of the surviving spent adults then make their way downstream shortly after spawning. Early spawners can be seen migrating seaward and passing later run spawners still migrating upriver. Eggs, which are about 1.3 mm in diameter, hatch in about three days at 22 °C and six days at 15.5 °C. The seaward migration of young generally occurs from mid July through early November at a size range of 32-152 mm, depending upon the availability of feed in the lakes, the total numbers of young produced in a particular watershed, and the length of time they remain in the freshwater environment. Blueback herring spawning requirements differ slightly from those of the alewife. They spawn in the main stem sections of rivers and streams and do not ascend into ponds or lakes. Blueback herring spawn from Nova Scotia to northern Florida, but are most numerous in warmer waters from Chesapeake Bay south. Blueback herring spawn from late May through mid-June. Females usually reach 100% maturity by age 5 and produce 60,000-103,000 eggs, whereas males generally mature at an earlier age (ages 3-4) and smaller size than females (US Fish and Wildlife Service, 2002). Why are alewives important to the State of Maine? Alewives are important to the ecology of freshwater, estuarine, and marine environments. They provide an alternative prey item for osprey, eagles, great blue heron, loons and other fish eating birds at the same time juvenile Atlantic salmon are migrating downriver. Alewives provide cover for upstream migrating adult salmon that may be preyed on by eagles or osprey, and for young salmon in the estuaries and open ocean that might be captured by seals. It is important to understand that alewives tie our ocean, rivers and lakes together, providing vital nutrients and forage needed to make healthy watersheds. Between and within those various habitats, everything eats alewives: striped bass, bluefish, tuna, cod, haddock, halibut, American eel, brook trout, rainbow trout, brown trout, lake trout, landlocked salmon, smallmouth bass, largemouth bass, pickerel, pike, white and yellow perch, seabirds, bald eagle, osprey, great blue heron, gulls, terns, cormorants, seals, whales, otter, mink, fox, raccoon, skunk, weasel, fisher, and turtles. Adult alewives are preferred bait for the spring lobster fishery. There are 35 Maine municipalities that have commercial harvesting rights to alewives on 39 streams and rivers. These runs provide revenue to the towns, many of which lease their fishing privileges to independent fishermen. Many of the fishways built for alewife restoration on some of our small coastal streams were partially funded by these municipalities because they recognized the value of this native fish species. The alewife and blueback herring are two of the eight principal species taken by the river fisheries in Maine and the most extensively distributed of the anadromous fish species in the state (Atkins 1887). The early fisheries for alewives were weir, dip net, seine, drift net, and set net. The bulk of the harvest during the 1800s was for human consumption, because they kept exceptionally well in salt or when smoked. The demand for alewives for human consumption declined with the widespread use of refrigeration in the 20th century that made many other fish species available to the market. Refrigeration also permitted the export of lobsters in bulk and increased the demand for these species as lobster bait. No commercial distinction is made between blueback and the more abundant alewife; the species are equally useful for bait, for food, and are harvested and marketed in a similar fashion. Alewives historically occurred in all major and minor coastal watersheds in the state. Declines in these populations were caused by the construction of dams and heavy industrial pollution, which rendered many waters unsuitable for their migration into freshwater spawning areas. The Clean Water Act of the 1970s has helped re-establish a cleaner environment that now enables the restoration of alewives and other anadromous fish species to their historic habitats. Current policies support restoring anadromous fish species to their historical habitats through cooperative efforts between the Department of Marine Resources (DMR) and Inland Fisheries & Wildlife (IF&W). Waters stocked with anadromous fish species, including alewives, are those that historically supported these species. Fish passage requirements at hydroelectric dams, a fishway construction program by DMR, and fish stocking efforts over the past 30 years have significantly increased the amount of spawning habitat available to alewives. Even with the increased access to habitat, commercial alewife landings declined in the 1990s and are thought to reflect a reduction in population size for most watersheds. The decrease is likely the result of decreased marine survival, overfishing, bycatch in marine fisheries targeting other species, and increased impediments to downstream passage. The Department of Marine Resources, as well as coastal municipalities granted the rights to river herring resources, cooperatively manage the municipal fisheries. Each town must submit an annual harvesting plan to DMR for approval that includes a three-day per week escapement period to assure conservation of the resource. Maine increased the weekly fishing closure from a 24-hour closure in the 1960s to 48-hour closure beginning in 1988. The closed period increased to 72-hours beginning in 1995 to further protect spawning fish. Most towns operate a weir at one location on each stream and law prohibits fishing at any other location on the stream. River herring runs not controlled by a municipality are governed by state law, which prohibits the taking or obstructing river herring passage from 6 AM on Thursday to 6 AM the following Sunday. Landings data are compiled annually from voluntary reports provided by individual fishers who harvest on streams not regulated under a municipal plan. Law mandates that coastal municipalities granted harvesting rights to report annual landings or lose exclusive fishing rights. Harvest/landings data for 2006 were 1.2 million pounds from 12 watersheds, 11 of which were municipally controlled fisheries. Many municipal fisheries are closed for conservation purposes. The management approach for alewives initially focused on providing or improving fish passage on smaller coastal drainages. The DMR has installed 17 fishways since 1969 and maintains 19 fishways from Cumberland County to Washington County. It also assists in the operation and maintenance of 12 non-hydropower dams owned by other public entities. With the advent of better water quality in the larger river systems, DMR has actively sought installation of fish passage in hydroelectric dams licensed by the Federal Energy Regulatory Commission. A restoration plan for alewives in the Kennebec River watershed above Augusta is the result of a 1986 agreement with hydroelectric dam owners and environmental groups. The plan called for stocking alewives in the program’s initial years to build up the population size, with eventual fish passage later. This agreement was modified in 1998 and incorporated into the Kennebec River Settlement Accord, resulting in the removal of the Edwards Dam in 1999, funding for the anadromous fish restoration program, and set new dates for fish passage. The alewife restoration program in the Kennebec River focuses on stocking lakes and ponds in the Sebasticook River watershed and the Seven Mile Stream drainage. Fish passage on the Saco River became available in 1993 when Central Maine Power built fish passage facilities at the Cataract dam located at head-of-tide. The amount of habitat available to alewives is limited in the Saco River drainage, but a moderate run is established as a result of a trap and truck effort. Passage became available at Skelton in 2002 with the installation of a fish lift by Florida Power and Light. Do anadromous alewives cause declines in freshwater species? It is alleged that alewives consume the majority of large zooplankton at the expense of fresh-water fish species. Sea-run alewives have evolved to take advantage of zooplankton production during times of the year when lakes and ponds are most productive (summer and fall). Alewives spawn in the spring, resulting in an abundance of small (less than 1- 6” in length) alewives for resident species to prey upon. Alewives leave the freshwater environment when zooplankton production declines (fall and winter). Therefore, lake productivity can accommodate alewives and freshwater species. There are over 90 lakes and ponds in Maine where sea-run alewives coexist with healthy populations of freshwater fish species. A 10-year cooperative study involving DMR, IF&W, and DEP showed that at a stocking rate of six adult alewives per acre, there were no detrimental effects to freshwater fish species in terms of size or abundance. Young-of-the-year smelt and pickerel actually grew better in the presence of alewives than when they were absent. Do alewives cause water quality problems in ponds and lakes? In two studies conducted by the Maine DEP, data indicated that alewives did not significantly alter water quality. A major factor in causing algal blooms is the introduction of phosphorus. After alewives spawn, the juveniles grow and incorporate phosphorus needed to develop, taking phosphorus with them when they return to the ocean. Typically, there is a decrease in total lake phosphorus due to alewife emigration. What is the difference between landlocked and anadromous alewives? Landlocked alewives spend their entire lives in large lakes and are part of the year-round ecology of those lakes in which they occur, such as the Great Lakes. Anadromous alewives occur in the freshwater environment only in the summer and fall before returning to the ocean. In several studies throughout the Northeast, landlocked alewives have been implicated in the decline of resident fish populations. However, there are no scientific studies to indicate that sea-run (anadromous) alewives have a negative impact on resident fish species. Thiamin deficiency can occur in trout and salmon that feed extensively on landlocked alewives. This phenomenon has not occurred in lakes where sea-run alewives occur. Sea-run alewives are absent from the freshwater environment for 6-8 months of the year, so trout and salmon cannot feed extensively on this species on a year-round basis. The most comprehensive study conducted in Maine is the Lake George Study. This was a 10-year collaborative study conducted in the 1990s by the Maine Department of Marine Resources, Maine Department of Inland Fisheries & Wildlife, and Maine Department of Environmental Protection. The Lake George Study investigated the effects of anadromous alewives on water quality, zooplankton communities, and freshwater fisheries. This report concluded that alewives had no negative impacts to the overall water quality, zooplankton community, or recreational fisheries of Lake George. The findings of the study are summarized below (Kircheis et al, 2004). This study looked at the effects of stocking alewives at a rate of six adults per surface acre of lake habitat. The water quality, as measured by Secchi disk transparency, and chlorophyll a concentrations were not significantly different with the presence of alewives, but were significantly reduced after their stocking ceased, perhaps because of increased rainfall and runoff and import of nutrients from the watershed. Total phosphorus concentrations were significantly lower with the presence of alewives than either before or after, perhaps reflecting phosphorus uptake by alewives. The introduction of alewives at six adults/surface acre resulted in a decrease in the population density of Cladoceran micro zooplankton and an increase in the population density of Rotatoria. Both populations shifted back to pre-alewife levels by the third year after alewife stocking ended. The four major sport fish species in Lake George showed no change in average length or weight when comparing the period before alewives were present vs. when represent. These four species were brown trout, smallmouth bass, chain pickerel, and white perch. None of the minor sport fish species present in Lake George showed any difference in average size or weight when comparing the period before to during alewife stocking. These species were brown bullhead, pumpkinseed sunfish, redbreast sunfish, and yellow perch. Young-of-the-year (YOY) landlocked rainbow smelt grew significantly faster during the three years when alewives were present in the lake. Possible causes for improved YOY smelt growth included changes in YOY smelt diet, mediated by alewife restructuring of the plankton community and decreased YOY smelt densities. Smelt population size, based on trawl catch rates, was lowest during the period when alewives were present in the lake. The study was not able to determine what combination of factors caused the decreased density: high trawl catches in the early years of the study, commercial harvest of adults in 1990 and 1991, competition with juvenile alewives, or some other factor(s). Young-of-the-year smelt and YOY alewives both fed heavily upon Copepoda and Cladocera, but statistical tests indicated little overall dietary overlap. This was likely due to the two fish species feeding on different taxa within the major prey groups, with alewives typically feeding on the larger zooplankters. 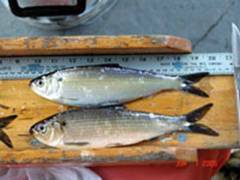 The dietary overlap between smelts and YOY alewives occurred during the first year that alewives were present, and declined each year for the next two years (Morisita’s test). Adult alewife and smelt diets never overlapped significantly. Adult alewives fed primarily on Cladocera and Diptera, but also fed upon Ephemeroptera, Copepoda, Trichoptera, Coleoptera, Odonata, fish (primarily yellow perch), and Mollusca. The most recent study conducted in Maine investigated anadromous alewife and smallmouth bass interactions in eastern Maine lakes. Maine Rivers sponsored the study by Dr. Theo Willis (Willis 2006). Maine Department of Inland Fisheries and Wildlife biologists provided additional data and support for the study. Portions of this report are provided below and support the conclusions of other scientists investigating anadromous alewife interactions with the environment. In 1981, fishway improvements led to resurgence in the St. Croix’s anadromous (searun) alewife population. Some blamed the decline in the smallmouth bass population in Spednic Lake on alewives. Public concern over the negative impact alewives might have on the economically critical smallmouth bass sport fishing industry included the perception that the presence of alewives anywhere in the drainage was a risk to the fishery. To address this concern, in 1995 the Maine Legislature passed legislation to block migrating alewives from ascending state-controlled fishways on the St. Croix to reach their spawning grounds. Restricted access to spawning grounds is accepted to be the primary cause of a precipitous decline in the St. Croix alewife population from hundreds of thousands of fish in the mid-1990s to just 900 fish in 2002. The St. Croix River study found no evidence from available historic data for Downeast Maine lakes that the presence of alewives systematically harmed smallmouth bass in terms of length, condition or growth. Diet studies found that fish constituted only a tiny proportion of the diet of adult anadromous alewives. Alewives were not significant predators on smallmouth bass. In most lakes, young-of-year smallmouth bass and young-of-year alewives did not have an ecologically significant overlap in diet. In the one lake in which diets were similar, populations of bass and alewives have coexisted for over a century. Based on one year’s data, therefore, competition for food between the two species does not appear to be important. Smallmouth bass tournament returns in the past few years were similar in lakes with and lakes without alewives, suggesting that the quality of sport fishing for bass does not differ systematically between lakes with and lakes without anadromous alewives. It was determined landlocked alewives are genetically distinct from the anadromous alewife populations in the St. Croix and in other investigated watersheds. They are almost certainly the result of an independent introduction of landlocked stock from lakes outside the watershed and not the result of a shift in alewife life history strategy within the watershed. Atkins, C.G. 1887. The River Fisheries of Maine. The Fisheries and Fishery Industries of the United States. Section V, Volume 1, pp 673-728. Kircheis, F.W., J.G Trial, D.P Boucher, B. Mower, Tom Squiers, Nate Gray, Matt O’Donnell, and J.S. Stahlnecker. 2004. Analysis of Impacts Related to the introduction of Anadromous Alewife into a Small Freshwater Lake in Central Maine, USA. Maine Inland Fisheries & Wildlife, Maine Department of Marine Resources, Maine Department of Environmental Protection. 53 pp. US Fish and Wildlife Service, 2002. The Natural History of River Herrings (Alosa pseudoharengus and Alosa aestivalis). Retrieved December 16, 2002, from http://www.fws.gov/r5cneafp/herring.htm. Alewife picture, description, and more from "Do You Know Your Catch?"